June for glamour-boy pacers is a month of distinct and prominent status. Now the continent’s largest purse for the division, the North America Cup showcases that group of sophomores that have shown promise as freshmen and those greatly improving at three. This year, so far, we have seen promised performances and strange disappointments, as well as we continue to witness unpredicted melioration. The North America Cup elims, Saturday, June 7, feature 22 colts that fit into one of the three categories mentioned and they will split into three $50,000 elimination miles to create the season’s earliest lucrative contest, the $1-million North America Cup at Mohawk Raceway on June 14. A pair of seven-horse fields and one eight-horse field comprises the eliminations. The top three finishers from each elim, plus a fourth-place finisher drawn by lot, will advance to the final. The eliminations have been carded as Race 3 (post time 8:05 p.m.), Race 5 (8:45 p.m.) and Race 9 (10:05 p.m.—all times EST) on Mohawk’s program. The elims present the bettor with three “Cups,” if you will, and usually provide great opportunity for horses going off at odds not comparable to their chances (overlays). This triptych need be addressed, then, as individually as possible, considering the best horses, as we know them now, are not all in the same contest. So, we are spending more time and space, as we usually do when the situation presents itself, on the elims then we will on the final. The Mohawk weekend also presents elims for the glamour-gals’ version of the Cup, the Fan Hanover. These will also take place on Saturday’s stakes-laden program, which also includes mare pacer elims for the Roses Are Red final next week. Older trotters face elims for the Armbro Flight on Friday, June 6. Soph-colt trotters go in the Goodtimes elims at Mohawk on the Friday, June 6 program. 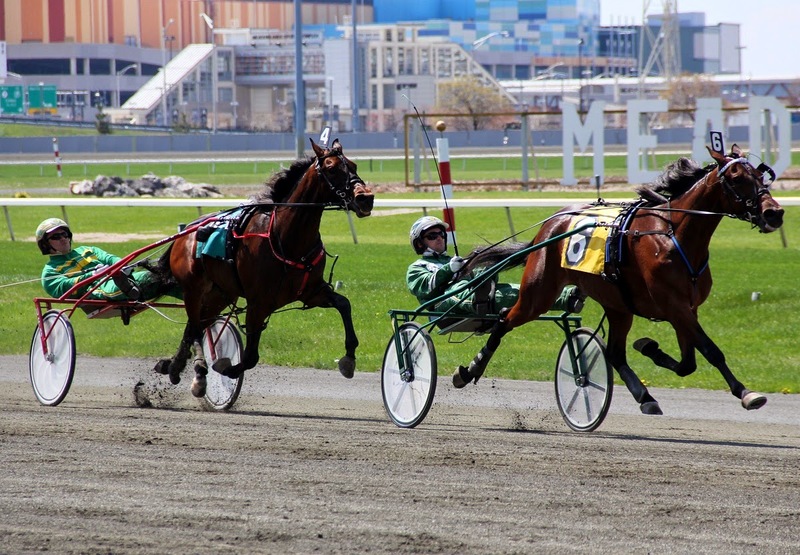 We analyze them at our exclusive blog, the Hambletonian Trail. Follow our analysis of the races featuring the eligibles to this year’s August trotting classics at The Meadowlands. Also this weekend go to the “Trail” blog and peruse our analysis of the Empire Breeders Classic finals. Check weekdays where there are not TwinSpires blogs for other events not covered within the blog deadlines. On June 7 in Ohio, Scioto presents the Charlie Hill Memorial for older trotters and some recognizable names have gone to the Midwest to shoot for the $200,000 purse. The Cup elim fields in post position order (driver and trainer), with comments pertaining to each, are listed below. Although JK Endofanera defeated Western Vintage last week, it was the latter that had to take the longest route home, just being beaten by Doo Wop Hanover at the Meadowlands. “JL” and “Vintage” are not an even match. Vintage is one of those freak horses that behaves badly, which can cost him (as it did at two) but that same delinquent personality may result in remarkable miles, with multi-moves and resilient acceleration. JK has much more to prove to be equal but because he is doing well at three he is the “now” horse. This leaves Western Vintage to be a second choice worth a bet. This division is tighter than what we expect from the betting. Always B Miki and Lets Drink On It will share a lot of the win bets, though the former may wind up with the last flow of big bucks from outside the track. We call your attention to the Jim Campbell-trained Sometimes Said, who has been overlooked by bettors all the way back to his place in the Breeders Crown final, where we gave him to you at more than 20-1 to win. He will be dismissed again, though maybe not as direly, and an upset is far from out of the question. Once again, the hoards of Hes Watching fans will be tossing their dollars into the hat, as the colt’s return to victory last week in a division of the Somebeachsomewhere made them all sigh with relief since his debut was a debacle. But the ever improving Doo Wop Hanover will not lay down and watch Hes Watching pace away with this and nor will Luck Be Withyou, who was nosed out of his soph debut by “Doo Wop.” These two, in more ways than one, are intrinsically better horses than Hes Watching and they will be ripping the quarters to prove it. Any speed dueling will give Boomboom Ballykeel a better shot at picking up the important real estate in the smoke of it all. So watch for extraordinary prices on Doo Wop and “Luck” to cash on this one. The Saturday Daily Double consists of the Fan Hanover eliminations, each seven-filly field worth $35,000. In the first half, Race 1, we like the gal we had in last year’s Breeders Crown soph pace final, the one that paid the only double-digit win price of the evening, Uffizi Hanover. She is back at four and from the jam-packed-with-talent Jimmy Takter barn, where some people forget there are sparkling pacers, too. Elim two pits six against Precocious Beauty, the dead-on choice here. But the Jamiesons’ Bahama Blue has been aimed towards the final and could ignite a big Double with an upset. “Beauty” will be up there and most likely make the final but this could be a shining moment for the locals. At Mohawk on Friday, the parade of elims for the weekend begins. The first of two $35,000 elims for the Armbro Flight brings seven trotting mares to the post, with the obvious favorite coming from post 7, Perfect Alliance. Her giant mile last week puts her in a starring role here. However, Ma Chere Hall is not about to surrender and in her new season could be better than she was when none of the division could beat Bee A Magician. The price will be right for the upset. As for Bee A Magician, she gets the public’s utmost support again, for sure, in elim two. But it is a new season and the Horse of the Year in 2014 has to deal with more than a few veterans of the aged division. That’s why we will go for D’orsay here. She is a battleaxe member of this division and when she puts in a good mile she pays well. The Roses Are Red elims are two more miles for the mare pacing division, most of which we have seen a lot already this year. There is enough talent to spread the win odds around in the first split and that may make Drop The Ball a bargain. From post 7 she will have to be winging, especially with Anndrovette on the inside looking for a steal. If she can control the pace against “Ann” and Shebestingin, another big price for this stalwart mare is on the table. Round two could be a similar situation for Yagonnakissmeornot, from post 6. She certainly has the speed to find the front off the gate and most of these ladies are not interested with stealing the show. With two from Ron Burke and Somwherovrarainbow in this seven-mare field, we could get a decent price for her. The Charlie Hill Memorial for aged trotters is a super event at Scioto Downs this Saturday, with a whopping purse of $200,000 and national invitations. On a state-oriented night, with sires stakes adorning the program, visitors include the biggest names in mature male trotters. Nine will line up, most of them well acquainted with one another. The majority of win money will no doubt be in the court of Market Share. Linda Toscano’s Hambletonian champ has taken no prisoners in the older division and keeps getting sharper. He breaks or he is as close a lock as you can have in this business. Creatine, one of the great overlays we gave you in our Hambletonian-day Players Pool last year when he won a Hambo elim at 5-1, returns to launch his season at four. Archangel, the N.Y.-bred that has a win in four starts at four and the ageless Arch Madness are here to make noise rarely heard in these parts. Going past Market Share is tough but we are on unfamiliar ground for most of these, so let’s take Modern Family. On May 10 we had the exacta with him and super-trotter Sebastian K cold while the crowd ignored “Family.” We figure this race will take a similar route, where Family shoots to the front and tries to steal it. It is kind of a lone-speed theory, since others in this group, including the big favorite, aren’t likely to make strong moves off of the start. Family may be able to control the field through the extra turn involved in a five-eighths track. A good price should be guaranteed.